Television has offered various forms of programming for children throughout the years, and like anything else, it sure has seen its fair share of changes over time! Yet in some cases, it seems the more things change, the more they stay the same. 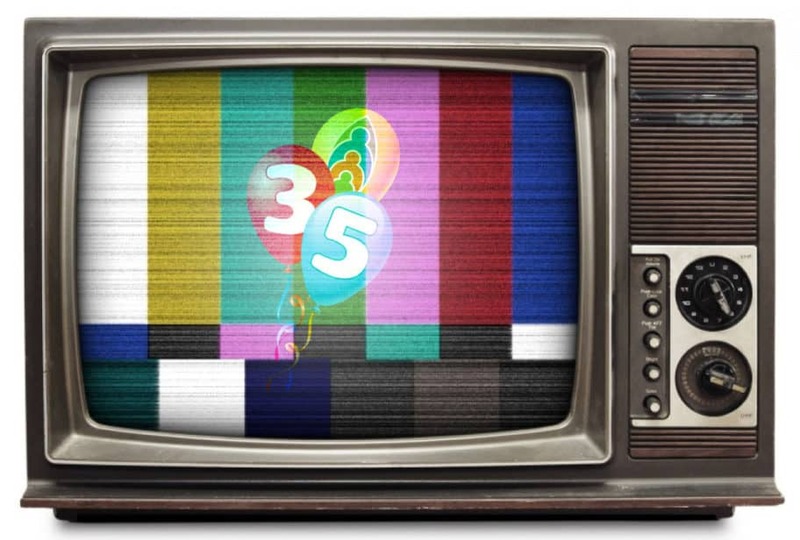 As part of our 35th anniversary celebration, we take a look back at a few of our past favorites, some of the popular programs of today, and a couple that have withstood the test of time. This charming PBS staple ran for several decades, featuring the lovable Mr. Rogers as he hosted audiences of all ages. During any given episode, Mr. Rogers toured various locations, demonstrated experiments, constructed crafts, played music and interacted with friends. Addressing a wide range of topics with tenderness and sincerity, the legacy of Mr. Rogers Neighborhood is still felt today. Who can forget “The Song That Doesn’t End”? Another PBS favorite, Lamb Chop’s Play Along featured puppeteer Shari Lewis and her lovable cast of snuggly animal friends: Lamb Chop, Charlie Horse, and Hush Puppy. Lewis’ goal with the program was to invite children to participate, rather than just passively watch. The upbeat energy of the show encouraged play, and often sought to teach valuable lessons within each episode. A by-product of Jim Henson’s beloved Muppets, the concept of Fraggle Rock was always intended to appeal to children all around the world. Featuring a host of colorful puppets known as Fraggles, Doozers and Gorgs, as well as people (or, as they were known in the world of Fraggle Rock, “silly creatures”), Henson’s message to children in each episode was that of embracing diversity and working together peacefully. It was a great place to “dance your cares away”! A spinoff of the beloved Mr. Rogers’ Neighborhood, Daniel Tiger’s Neighborhood features many of the beloved characters Fred Rogers developed for the Neighborhood of Make-Believe in his own program. Following the tried and true formula Mr. Rogers had mastered years earlier, the bright and colorful show seeks to engage preschool aged children with lessons teaching emotional intelligence and human respect. Based off the children’s book “The Chicken Problem”, the PBS program Peg + Cat features a curious little girl named Peg and her talking cat, Cat, as they embark on various adventures. The show seeks to inspire the natural curiosity of children and encourage the development of math and problem solving skills. Keeping the theme of math consistent throughout the show, the animation is depicted as if it were on graph paper. For nearly 20 years, Bob the Builder and his friends have entertained children with adventures filled with building, renovating and creation. With a full cast of bright, friendly characters, the philosophy of the program is to inspire creativity within children, and encourage cooperation, conflict resolution, and various other learning skills. Beginning in 1984 and through today, Thomas the Tank has entertained countless amounts of children. Along with a full cast of other brightly colored train engines, Thomas and his friends live on the fictional Island of Sodor. Stories on the program generally feature one of the characters encountering a problem or a challenge of some sort. Working together, Thomas and his friends are able to resolve the conflict by the end of the episode, and impart valuable lessons on their young audience along the way. With nearly 4,500 episodes aired since 1969, Sesame Street remains one of the most recognizable names in children’s television programming. Jim Henson’s Muppets have imparted many educational lessons to children throughout the years, on topics as varied as the alphabet and numbers to diversity. After so many years, Big Bird, Ernie, Oscar the Grouch, and many of the other memorable icons of Sesame Street are among the rare group of characters that multiple generations have had the pleasure of growing up with. Preschool parents supply a crib sheet for cots, an extra change of clothes, and lunch. Little Sprouts will provide a morning and afternoon snack, but parents may pack their own. A comfort toy for sleeping is welcome in the classroom at this age. Due to weather conditions, there will be no transportation for Haverhill, Lawrence, Methuen, Andover or North Andover. Little Sprouts Haverhill NECC is CLOSED. We make affordable, NAEYC accredited, quality early education available to families in Nashua and surrounding communities, as well as Federal and FAA employees. *For government employees and Federal Aviation Administration (FAA) employees, we offer extended hours until midnight or on weekends. In special circumstances, community members (not employed by the government) may be granted access to extended hours. Please contact the Executive Director for more details. © Little Sprouts, LLC. All Rights Reserved.